Anyone who’s crazy about kale knows it’s a leafy green superfood that’s delicious served raw, like in a salad. Here, the leaves are roasted until crispy and browned, just like kale chips. With chewy Fregola Sarda, toasted pasta from the island of Sardinia, and juicy roasted tomato, this meal is not only healthful and jam-packed with flavor, but covers a spectrum of textures that make it fun to eat too. Preheat the oven to 475°F. Heat a small pot of salted water to boiling on high. Peel and slice the garlic. Pick the basil and oregano leaves off their stems. Remove the thickest stems of the kale leaves. Peel and mince the shallot to get about 2 tablespoons of minced shallot. Slice the tomato horizontally into 4 thick slices. 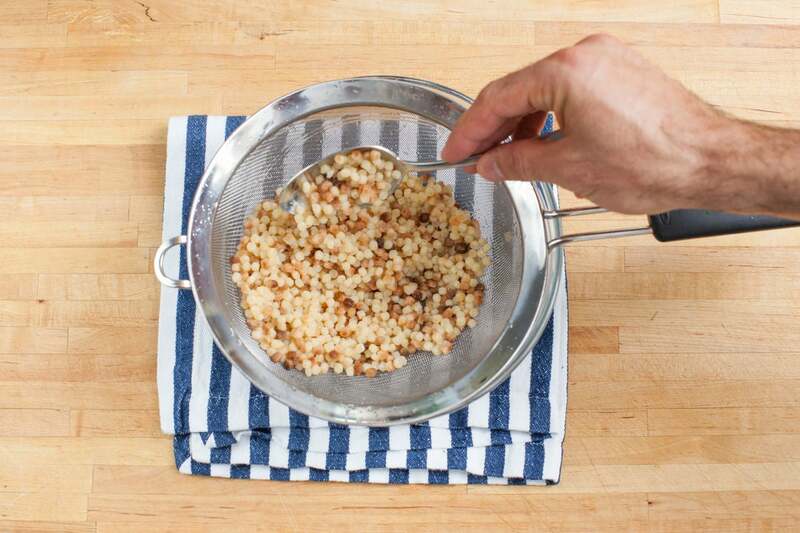 Add the fregola to the boiling water. Cook about 15 minutes, or until tender. Drain and rinse under cool water. 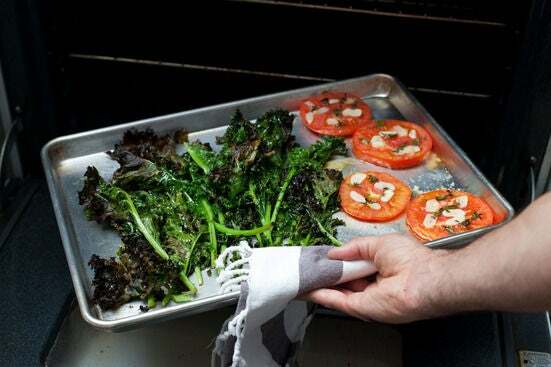 While the fregola cooks, place the kale on a large baking sheet. Drizzle the kale with olive oil and season with salt and pepper, tossing to coat. 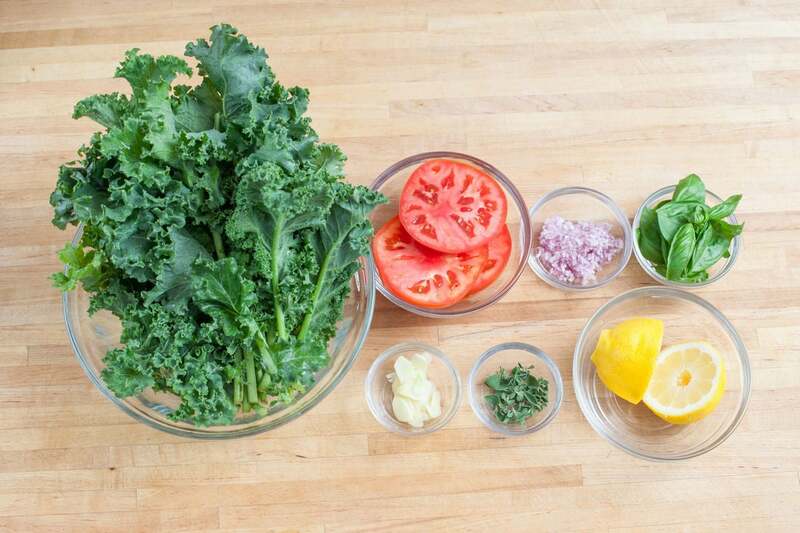 Place the tomato slices beside the kale. Drizzle the tomato with olive oil and season with salt and pepper. 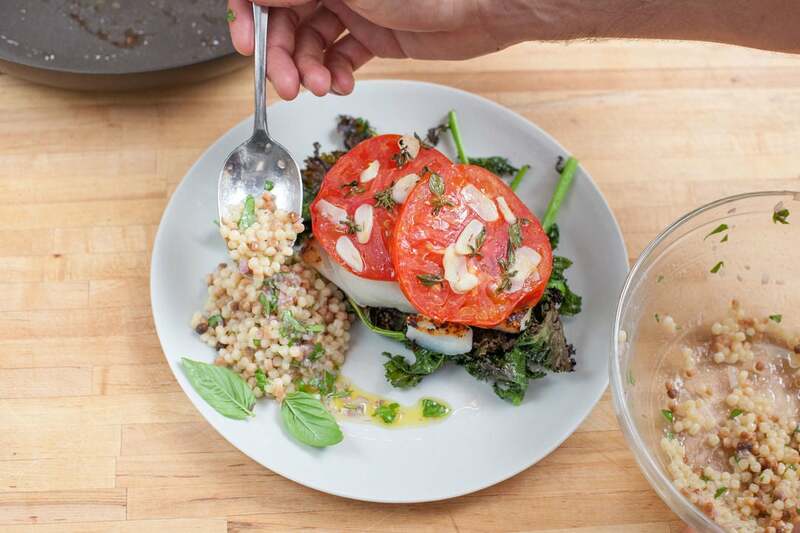 Place the sliced garlic and oregano leaves on top of each tomato slice. Roast in the oven 10 to 12 minutes or until the kale is browned and the tomato is softened. Pat the cod dry with paper towels and season it with salt. 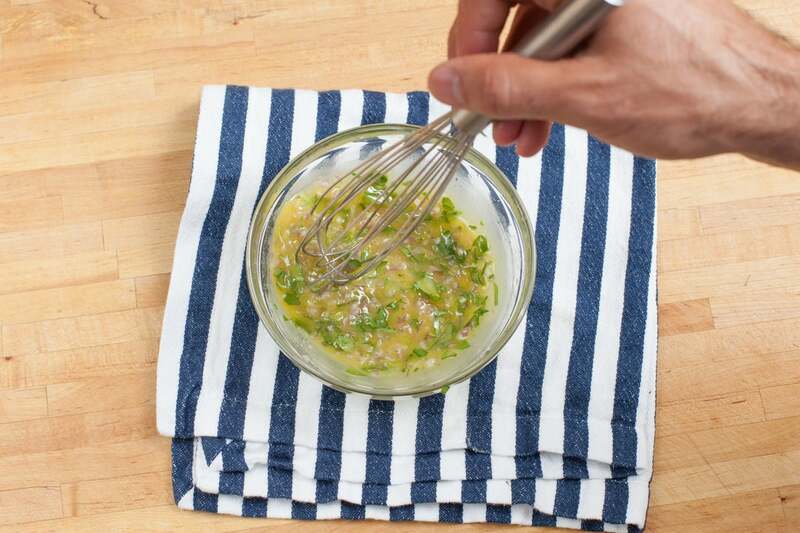 In a large pan, heat some olive oil on medium-high until hot. 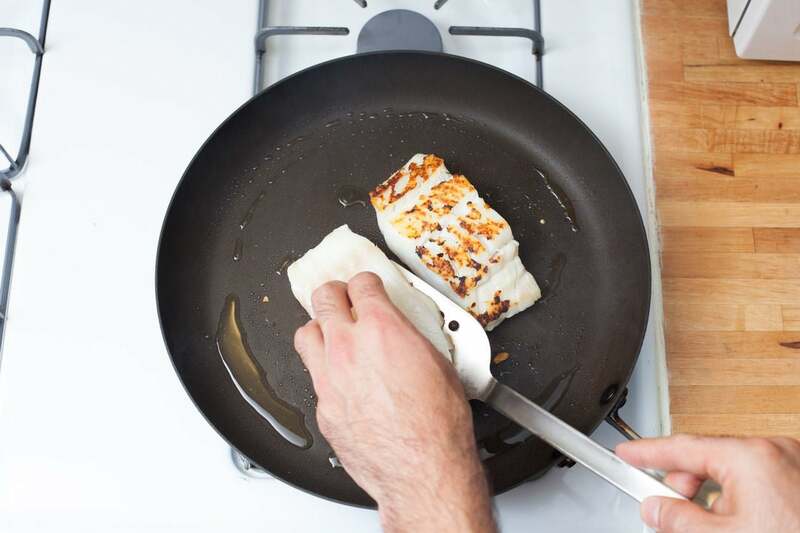 Add the cod to the pan and cook 3 to 4 minutes per side, or until cooked through. Divide the crispy kale between 2 plates. 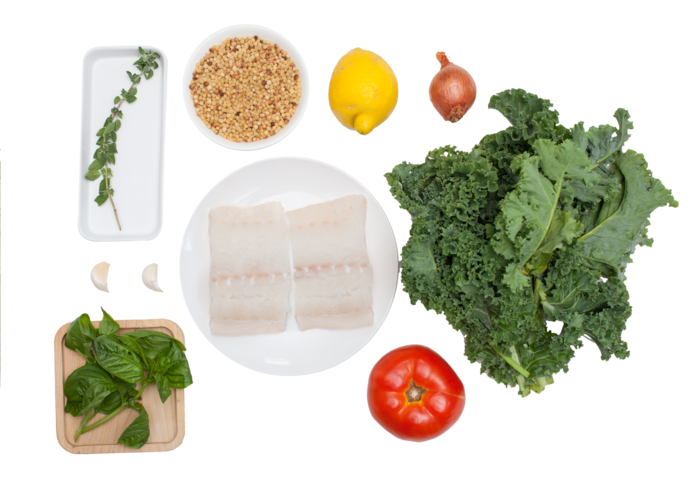 Place a piece of cod each on top of the kale. 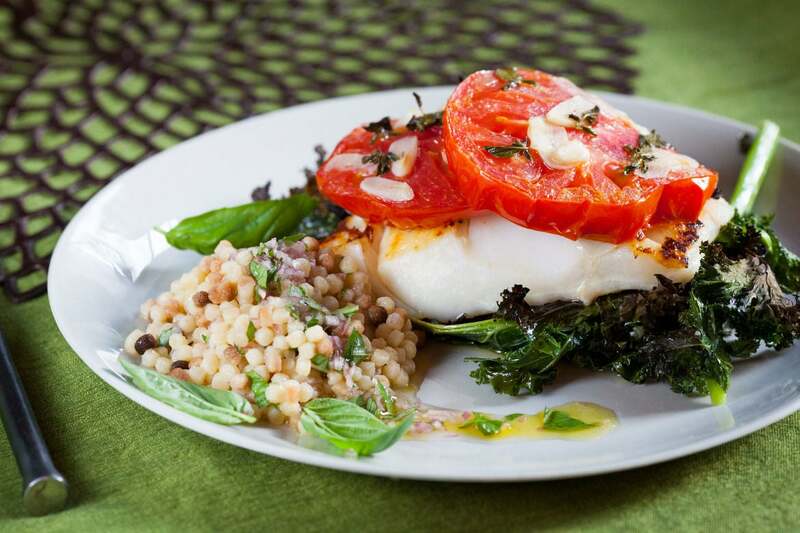 Place 2 slices of tomato on top of each piece of cod. Spoon half the dressed fregola onto each plate. Garnish with the remaining basil leaves and any remaining dressing, if you like. Enjoy!